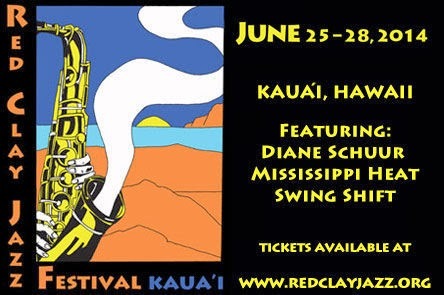 Don't miss the premier line-up of premier jazz and blues musicians at the Kauai Red Clay Jazz Fest, musicians will play late afternoons and in the early evenings at the outdoor, ocean-view setting for the main Red Clay Jazz Festival event at Kauai Lagoons. Starting at 4 p.m., the concert features Grammy Award winner Diane Schuur; the nationally acclaimed Chicago-based blues band, Mississippi Heat and Kauai’s jazz specialists, Swing Shift with Dennis McGraw and David. An additional feature of Saturday’s concert will be a number of food and beverage vendors offering a variety of locally grown organic and specialty foods itmes, along with beer, wine and Koloa Rum drinks. Tent seating is available for Saturday’s concert, attendees can also bring chairs if they like. A special promotional rate of $55 is available for those attending both the Friday and Saturday concerts. Make plans to attend this popular event!